Are we this far through the year already? Where has the time gone? I have boxed off a fair few Christmas presents already which is super not like me at all and I may even get some wrapping up done tomorrow since I found the perfect paper and supplies. So without further ado I want to introduce you to my November sponsors. What is Tea Trail London I hear you ask. It is brilliant if I may add. Brilliant for a tea fiend like me. And I know this will be of super super interest to you all over here on The Tea Bee. Tea Trail London is brought to you by the Horniman Museum. 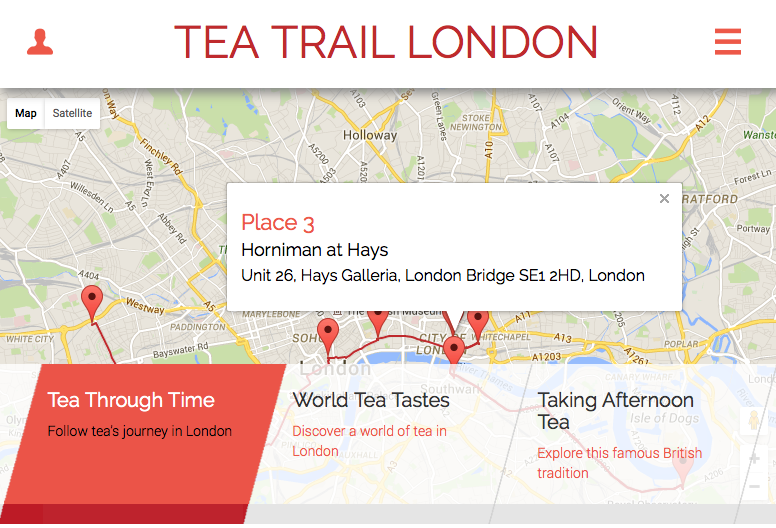 It is helps you explore the heritage of tea in London using three different unique trails. You find out some historic tea traditions while visiting some fascatnaing London tea haunts such as museums, shop and tea houses. Tea Through Time – Follow teas journey through Britain, discovering the people who imported our beloved leaves and how it even got to our shores in the first place. See how it was recieved and accepted to be what it is today nearly 500 years ago. World Tea Tastes – How is tea drunk around the world? I can guarantee you no one will really understand a good old builders brew like us if you frequent the tea houses in China or India. ‘milk, two sugars love?”. Explore different ways and styles tea is drunk around the world, highlighting just ho blooming popular tea actually is. Taking Afternoon Tea – Saving the best till last wasn’t I? Take a look at some of London’s most famous landmarks and enjoy a brew or two. This trail takes you from Forntum & Mason to The Ritz and from Yumchaa to Masion Bertaux. You can take a peek for yourselves over on Instagram, Twitter and Facebook. Hi everyone, Flo here. I want to introduce you to me, myself and I. Positively Flo is a vintage jewellery supply shop. Vintage charms, antique beads and retro findings are salvaged from jewellery that would otherwise be discarded and forgotten. These beautifully intricate pieces of years gone by are used by designers and crafters all around the world for new jewellery pieces, craft projects and even Christmas decorations. Pop over and say hello over on Instagram, Twitter and Facebook. Hi, I’m Betty, a country bumpkin turned city dweller currently living in London. When I am not blogging about scrumptious recipes and adventures in London, I’m generally found singing (both on stage and in the shower) or teaching in my 2 bed abode south of the river. I’m an eat-the-cookie-mixture-before-it’s-in-the-oven type of lady (and I mean spoonfuls not just a lick) who loves dogs, cooking for friends & having snuggly nights in the Downton Abbey, my boyfriend William and most importantly watching Christmas films when it’s not Christmas. You can find Betty over on Instagram, Twitter and Facebook. If you would like a sponsor spot over on The Tea Bee go check it out and do feel free to send me a message.